This is the first of a two-part series on conditioning catchers. Part I will outline specific exercises to help ensure that catchers warm-up properly for safe, effective performance. 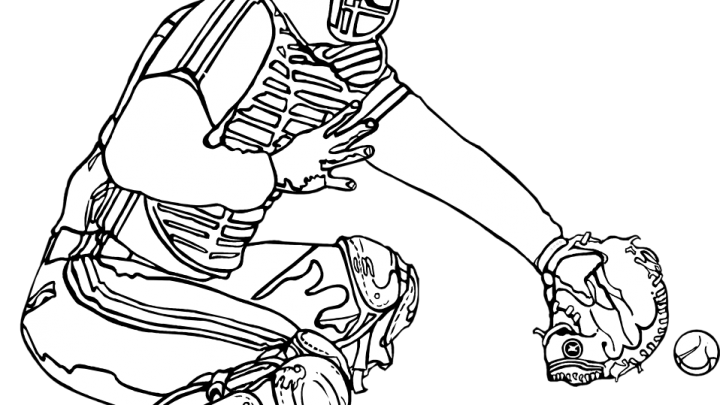 Part II will outline specific exercises and procedures to help ensure that catchers are able to recover between games, maintain personal health, reduce the risk of injury and play at a high level throughout the season. In game situations, catchers make more throws, get up and down more often and run farther than any other player on the field. Not only do they call and receive every pitch, but they do it on average more than 130-150 times per game and 140-150 games per season. The position also requires equipment that by its very nature can add up to five extra pounds of weight and increase the risk of dehydration and heat stress. Catchers are also subject to errant balls, foul tips and flying bats making virtues such as strength, stamina and courage in collisions a high demand. Since most starting catchers make 5-6 starts per week, durability is a primary requirement of the position. Successful starting catchers, in general, have tremendous work ethic and the ability to recover between games and maintain personal health, nutrition and fitness throughout the season. the movements of other players start from a standing position. 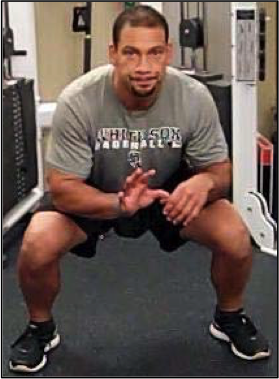 Because of the squatting position catchers endure, the hips are internally and externally rotated independent of each other and occasionally as opposites with one knee down and one knee up. Warm-up starts with active, dynamic movements of the hips and ends with mild static stretching. Active Hip Movement in Three Planes of Motion. Forward and backward leg swings (sagittal plane) improve dynamic hip flexibility and mobility and enhances core stability from a standing position. Set up: The athlete stands with feet shoulder-width apart and holds onto a stationary object at his side to ensure balance. 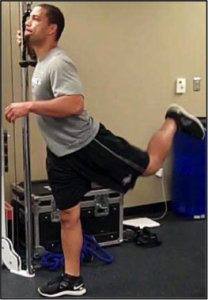 Movement: With the knees slightly bent and chest and head up, the athlete sets the core and swings the inside leg forward and up, toes to the sky, and then swings it back as far as comfortable. 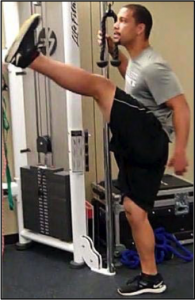 It is important that the trunk be kept upright throughout the movement and that there is no extension in the low back during the backward leg swing. 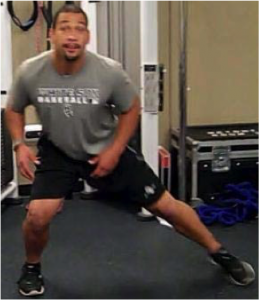 All movement must be from the hip joint, not the low back. Movements should start in a slow, rhythmic and controlled manner and gradually increase in velocity and range of motion. Start with one set of 7-10 reps on each leg and gradually progress to 2-3 sets as time permits. Rest between sets is determined by the overall condition of the athlete. 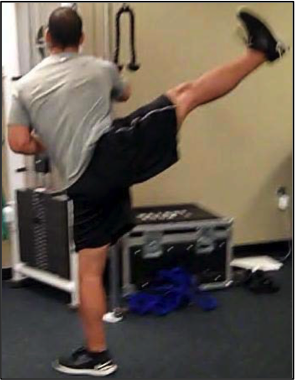 Lateral leg swings (frontal plane hip swing with transverse plane movement at the end) improve dynamic hip flexibility and mobility and enhance core stability from a standing position. Set up: The athlete stands with feet shoulder-width apart and holds onto a stationary object in front of him to ensure balance. Movement: With the knees slightly bent and chest and head up, the athlete sets the core and swings the inside leg out as far as comfortable with toe up and then swings back past the starting position as far as comfortable. It is important that the trunk be kept upright throughout the movement and that the plant or support foot remains in the same position throughout the movement. Movements should start in a slow, rhythmic and controlled manner and gradually increase in velocity and range of motion. Start with one set of 7-10 reps on each leg and gradually progress to 2-3 sets as time permits. Rest between sets is determined by the overall condition of the athlete. 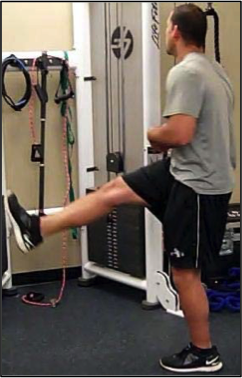 System of three – lateral leg swings with pause (frontal plane with isometric hold on every third swing) improve dynamic hip flexibility and mobility, enhances core stability and improves static, end-position strength from a standing position. 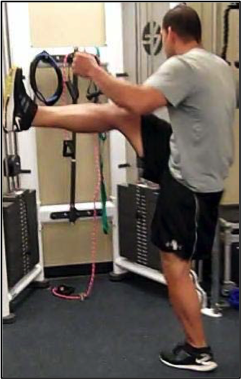 Movement: This exercise is performed the same way as the lateral leg swing but the athlete holds the outward and back hip position every third rep to increase range of motion in the hip rotators and static, end-position abductor and adductor strength. The sequence is 1-2-3 hold and repeat. Start with one set of 7-10 reps on each leg and gradually progress to 2-3 sets as time permits. Rest between sets is determined by the overall condition of the athlete. Jockey position foot taps increase range of motion, mobility, balance and end position, static strength from a position-specific squatting position. Step up: The White Sox term for the catching position is called the Jockey Position. 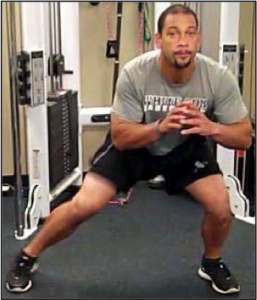 Movement: From a balanced, standing position with feet wider than shoulder with position and one foot slightly forward, squat down into a catching position with body weight evenly distributed on both feet. Shift body weight slightly over the left foot and then pick up the right foot, move it 6-12” to the side and tap the ball toes and ball of the foot up and down as quickly as comfortable for 20 reps. Repeat on the opposite side. Start with one set of 20 in a controlled manner and gradually increase the speed and range of movement. Build to 2-3 sets of 20 reps each side. Keep the core tight and head and shoulders up and facing forward throughout. Avoid leaning to one side and remain in the jockey position. The core and hip flexors on the opposite side of the taps are firing to help the athlete stay balanced, so avoid leaning to one side and remain in the jockey position. The tap right (first base) and left (third base) is the first movement a catcher will make from a natural position-specific movement progression. Box step ups or ins and outs (frontal plane) increase range of motion, mobility, balance and dynamic lower body strength from a position-specific squatting position. 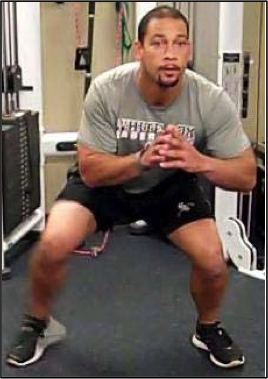 Set Up: Start the exercise without a box and gradually incorporate a 4-inch box as the movement becomes more efficient. This movement has three progressions. Movement: Start from a ready position with feet approximately shoulder-width apart. The athlete sets the core takes two steps to the right, lifts the right foot a little higher than 4” and simulates stepping up onto a box with the right foot. Return to the starting position and repeat on the left foot. 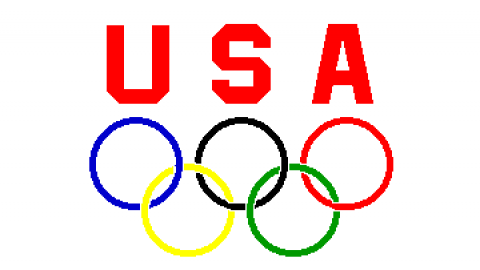 Start with one set of 7-10 in a controlled manner and gradually increase the speed and range of movement. Build to 2-3 sets of 7-10 reps each side. Keep the core tight and head and shoulders up and facing forward throughout. When the athlete can perform the movement efficiently and under control, repeat the movement onto and off a 4-inch box. The final progression is to perform the movement starting from a jockey position and stepping on and off a 4-inch box. 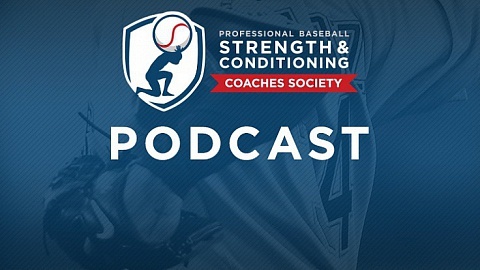 Alan Thomas, RSCC, is the Head Strength and Conditioning Coach for the Chicago White Sox.